Follow the same instructions for the almond flour brownie bites. Melt the butter or coconut oil over low-medium heat in a small saucepan. Stir in the cocoa powder. 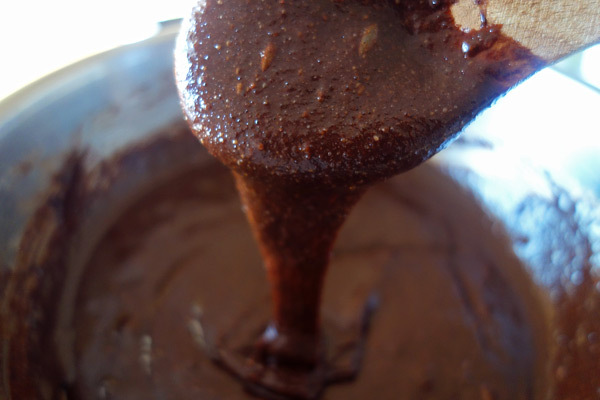 Transfer the chocolate mixture into a mixing bowl and let it cool for a few minutes. Add the eggs. Stir the chocolate mixture well until the eggs are completely mixed in. Stir in the almond meal and flour until completely incorporated. Pour the brownie batter into a baking dish and bake in a preheated oven. While the brownies bake, crush the graham crackers. Remove the brownies from the oven after about 12 minutes. They won’t be completely cooked yet. Sprinkle with crushed graham crackers. Then add the mini marshmallows. Add as many as you’d like, but remember they’ll expand a little bit when they’re baking. Bake the brownies for another 5-10 minutes until the marshmallows are golden brown. I’m thinking these will be a fantastic treat for summer BBQs. It already feels like summer here in LA. Pour batter into 8 x 8 dish and bake in 325 degree oven for approximately 12 minutes. While brownies bake, coarsely crush graham crackers using fingers or food processor. Remove brownies from oven and sprinkle crushed grahams. Cover with mini marshmallows. Place in oven and bake another 5-10 minutes until brownies are cooked and marshmallows begin to brown.